The Walking Dead Season 3 exploded out of the gate a few months ago, offering up fast-paced, tense and shocking moments that really defined the direction this season was headed. And yet, after the hiatus, it felt as if the episodes stumbled a bit, providing some great moments like the shocking first attack on the prison, but also ones where Andrea was still making up her mind on what to do. Really, a lot of it felt like the waiting around for the big confrontation between the prison and Woodbury. "Welcome to the Tombs" delivered a solid ending to the season, wrapping up character arcs, providing the battle between good and evil, shifting the story and those involved in a new direction, and of course, showering us in a variety of exploding guts, head shots and gruesome deaths the show seems to relish. A lot of the episode, as was much of the season, focused on the two opposite paths taken for the almost mirror image characters of the Governor and Rick. The Governor - who may have been a good person in the past, according to Milton - had descended into a twisted and sadistic evil with no real hope of returning from. He may have been a little unstable with his heads in fishtanks or keeping his zombified girl alive, but it's become so obvious now what type of man The Governor has become. He beat the crap out of Milton before stabbing him violently, and then locked him in the room so he might turn into a walker to rip Andrea apart. He even led an all out assault to finish off every survivor at the prison. But it was slaughtering his own innocent army of Woodbury citizens without so much as a blink that really tipped him over to full dark side. I felt bad for Martinez and the other guy for having to get back in the truck with him. I think his words, "You kill or you die. Or you die and you kill" do hold a certain truth, but not the ultimate truth. And certainly not the way in which the Governor chose to make his decisions. But it's that same thought process that had slowly seeped into Carl's mind. This is a boy who has grown up in this apocalyptic time, experiencing the harshness of the world including the deaths around him, so it does make sense for him to come to a similar conclusion. It was a shocking moment when he shot the Woodbury guy who was handing over the gun. You want Carl to turn into that good hero, but taking such an action has him headed down a path that could turn him into the next Governor. He is still a kid, after all, so his mind is impressionable. Which I think is something Rick realized after Carl explained what he had done, and really, without remorse. 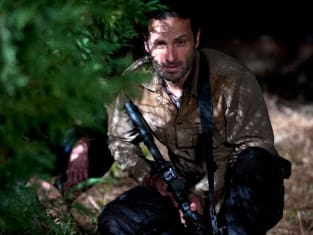 Rick himself has been conflicted on the course of actions to take, but ultimately, he chose the right one in not giving Michonne up and trying to take out the bad guy Governor instead. More so, he's really turned a corner in illuminating that chance for hope and the reality that there is still a sense of good and humanity among people. Now, why he chose to bring them to the prison instead of all going to Woodbury is beyond me, but I understood what the resolution meant. It was a great moment watching him proudly stand in the sun, as the Woodbury survivors joined the prison group. At the same time, where Rick had seen his ghost wife at the start of the hour, she was no where to be found, as if he had turned a positive corner. You hope the move is the right influence on Carl, but the little Grimes wasn't at all happy about Rick's decision. Could it mean negative consequences down the line? Sure, but keeping hope alive and showing that it's not all about killing was the right move to make. In a lot of ways, that idealistic notion of good was what Andrea had been preaching the whole time. She was so stuck on the concept of not killing and saving everyone that it cost her dearly. I was bummed that she had to die, even if watching her make poor decisions has frustrated me to no end this season. Certainly, down to the last moment, she stuck to her terms and was essentially that extra catalyst for pushing Rick towards bringing the two groups together. Similarly, I wished Milton didn't have to die. 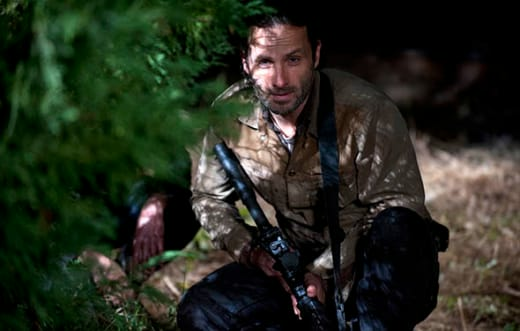 He was such a quiet good guy, but his last moments were standing up to the Governor and trying to save Andrea. I was really hoping we might have gotten to see what he would have been like with the prison. That said, his moments with Andrea were riddled with tension. I never knew if he was dead or if he had finally turned, at the same time I was cringing in anticipation as Andrea took forever in trying to free herself. Even the attack on the prison, the walk-through in the dark recesses of the jail, Rick and the group making moves, were laced with pulse pounding moments that really drove the characters and story to the next level. It felt like things were happening, the characters all getting their moments to shine (I mean, Beth was even killing walkers! ), and the story wasn't dragging it's feet anymore. I even appreciated the quiet, hopeful end of the hour, rather than some wild cliffhanger. Sure, the Governor's still out there, but for the time being, amongst all the carnage, conflict and consternation, rose a sense of peace. The sun rising was like a new beginning. Overall, an engrossing finale to a rather entertaining season, although it really does make me wonder where The Walking Dead will be headed next. What did you all think? Did you love it or hate it? Shocked at the deaths? Surprised by Rick's final decision or Carl's thoughts?